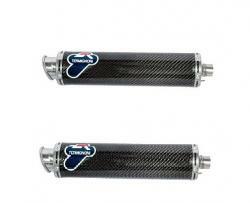 Choose the Termignoni exhaust for the Harley Davidson XR 1200 R, available in racing and homologated versions. The system is made of selected high quality materials that ensure lightness and strength. The Stainless Steel structure and the carbon sleeve guarantee a significant weight reduction, which makes you significantly improve the performance of your bike. Power and agility for a more responsive and exciting drive. More resistance for a longer duration over time. Manufactured with carefully crafted materials by our specialised staff, the Termignoni exhaust for Harley Davidson is designed by the Racing Department to ensure your bike meets the ideal combination of aesthetics and aerodynamics. Termignoni sports motorcycle exhausts are designed to get the best out of two wheels, maximum performance and the emotion of the Italian Sound, for a racing experience with a strong character.